Who Is Umar Farouk Abdulmutallab? Air Security Rules: Are We Any Safer? Any lingering signs of holiday relaxation were absent on Tuesday when Barack Obama emerged from the subterranean Situation Room and a high-pressured meeting with his top national and homeland security staff. The same President who played golf along Oahu beaches the day after a Christmas bombing attempt on a Detroit-bound airliner now appeared stone-faced and grim. In a brief statement to the nation, he used the word "failure" six times to characterize his government's performance. "The bottom line is this," said Obama, in the grand foyer of the White House. "The U.S. government had sufficient information to have uncovered this plot and potentially disrupt the Christmas Day attack, but our intelligence community failed to connect those dots." The severity of his mood had been reflected behind closed doors as well, and the message was impossible to miss. As he addressed the heads of his intelligence, law enforcement and foreign affairs agencies, for whom the notion of failure was not at all abstract, the President spoke directly about his "solemn responsibility" to protect the American people, according to a senior Administration official who attended the meeting. "I take that responsibility, and I take it very seriously," the President told his aides, making perfectly clear that there was no room for another series of errors. Shortly afterward, John Brennan, Obama's top White House counterterrorism aide, spoke. "There are things we could do better," he said. "I take my share of the responsibility in ensuring we have an up-to-date system that is agile and that challenges the assumptions the way this President wants." At issue were a number of key mistakes that Obama and Brennan had already identified. Intelligence agencies knew, for instance, about the intent of radicals in Yemen to attack the U.S. They also knew that the suspected bomber, Umar Farouk Abdulmutallab, had traveled to Yemen and that his father had contacted the U.S. embassy in Nigeria with concern that his son had fallen in with radical elements. Making matters worse, no one in the intelligence community tied the two sets of information together, inquired as to whether Abdulmutallab had a U.S. visa or thought to add him to the no-fly list, which would have prevented him from boarding the plane on Christmas Day. Obama had already announced a number of changes to deal with these oversights, and he promised more on Tuesday. Security screening has been beefed up at both domestic and foreign airports, especially for the citizens of countries like Pakistan, Saudi Arabia, Syria and Sudan. More air marshals have been added. More names have been added to the no-fly list. "The State Department is now requiring embassies and consulates to include current visa information in their warning on individuals with terrorist or suspected terrorist connections," Obama said on Tuesday, citing a new effort that had been announced in the Situation Room meeting, which was attended by Secretary of State Hillary Clinton. But Obama's evident frustration reflected the fact that no amount of security measures can stop a plot if the information about potential terrorists isn't used properly. It's the very centerpiece of the damning 9/11 Commission Report  the ability of intelligence agents to "connect the dots." Five years ago, the commission identified as a central concern the "pervasive problems of managing and sharing information across a large and unwieldy government" and proposed a raft of remedies, including a National Counterterrorism Center, a new director of national intelligence and a wholesale cultural shift in how spies think about information. These remedies were all adopted by President George W. Bush, but the work was never completed, even if the previous White House occupants wanted to claim victory. "They wanted to proclaim that we had in fact solved the problem of information sharing," says Ted McNamara, who resigned in August 2009 as the program manager for the Information Sharing Environment, a congressionally created office to oversee the effort. "I think I convinced them that it was not a good idea. A) no one was going to believe them, and b) there were too many problems that were cropping up all the time." The problem, Administration officials say, is not simply one of information sharing. At issue in the Abdulmutallab case are the intelligence community's policies to make sure that the information is used in a timely and intelligent way, "stitching it together," as the President put it. "Most of the organizations are built around means of collection, not means of outcomes," explains Dale Meyerrose, who served as the first intelligence community information-sharing executive under Bush, until he left government service in 2008 to join the Harris Corp., a government contractor. Obama's team has decided that the old triggers that were put in place to alert intelligence analysts have not kept up with the evolving threat of al-Qaeda and its sympathizers. "Five years ago, it would have been one thing if a Nigerian went to Yemen," said the senior official involved in the discussions. "It's different now when a Nigerian in the summer of 2009 goes to Yemen, because we know that al-Qaeda is trying to make a play in West Africa, specifically in Nigeria." The full investigation into the systems for flagging important information is ongoing, and Obama promised on Tuesday to make public over the "next few days" a summary of the preliminary report on the failures that led to the near deadly Christmas bombing plot. But there is little doubt that a new tone has been set among Obama's senior staff, which through much of 2009 was able to celebrate a number of key intelligence victories that thwarted developing threats in Denver, New York, Texas and Illinois, among other places. 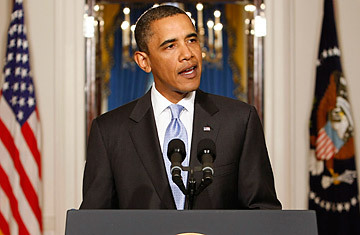 In the meeting with his staff, Obama used words that he would not repeat before the television cameras an hour later. "This was a screwup that could have been disastrous," he said. "We dodged a bullet, but just barely." If it wasn't already clear, the President put the government on notice. It has failed once. It cannot afford to fail again. Read "A Silly Argument: Obama Was 'Distracted,' So Flight 253 Almost Blew Up."